Del Mar's highly effective “Ship and Win” program, which for the past eight years has provided substantial incentives to owners and trainers to import out-of-state horses to race locally, will be back for a ninth summer at the shore with yet another enhanced bonus package attached in hopes of luring more runners to the seaside Thoroughbred racing oval. At its inception in 2011, “Ship and Win” offered horsemen an automatic check for $1,000 and a further 20% first-race, purse-enhancement bonus for their new starters. In 2017 those monies were raised to $1,500 and 30%. Then last year the automatic check was elevated again to $2,000. For the 2019 season, which opens on Wednesday, July 17, that initial ready check for all imports has climbed once more to $2,500. Additionally, the first-race purse bonus has been boosted anew to 40%. The “Ship and Win” program has been a winner for all individuals involved, as well as for the sport at Del Mar and throughout the state of California. Specifically, the first year that Del Mar put “Ship and Win” in play it drew 107 horses. Heading into 2019, the track now can count more than 1,100 runners having been brought on board via the program, with those horses having made over 1,750 starts locally and more than 3,700 subsequent starts at other state tracks, such as Santa Anita Park, Los Alamitos and Golden Gate Fields. The equine influx has helped Del Mar maintain one of the highest field-size averages in the country – in 2018 it was 8.7 runner per race (summer). In the case of a starter in a first-level allowance race, he noted that the $64,000 purse would be heightened by “S & W” bonus monies of $25,600, meaning those horses are competing for a prize of $89,600. He stated further that a $32,000 claiming horse will normally run for a pot of $40,000, but with the “S & W” boost of $16,000 included, that purse rises to $56,000. Even the $20,000 maiden-claimer is notably propped up by the reward package with their $21,000 prize having an additional $8,400 added to it for a final target of $29,400. Jerkens said the now well-established program has offered local horsemen strong incentive to bring fresh stock to Del Mar and the California racing circuit, a plus as the racing product statewide competes for wagering dollars nationally. Also, he added, in the case of racing individuals and outfits from outside the state, “S & W” makes a direct statement that Del Mar and California racing in general welcome them to one of the best circuits in the sport. There are just a few basic rules for “S & W” horses: An eligible horse must have made his/her last start outside California and cannot have raced in the state within the past 12 months. First-time starters are not eligible. All stakes runners are eligible to receive the $2,500 starter fee, but no stakes runners – including overnight stakes – are eligible for the 40% first-race purse bonus. 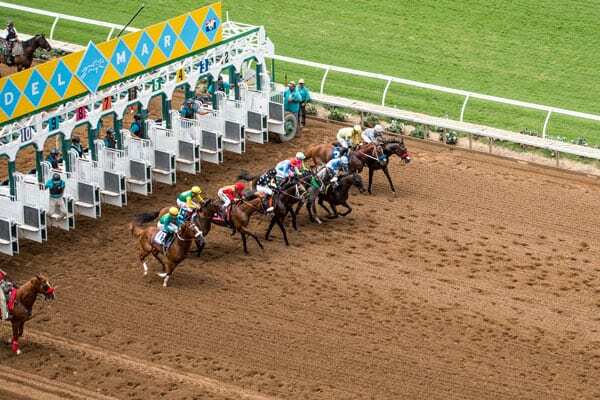 Those with questions concerning the program are encouraged to contact Jerkens, or Del Mar's executive vice president for racing, Tom Robbins, at (858) 792-4230. Del Mar's 80th summer stand runs from July 17 to Labor Day Monday, September 2, a total of 36 racing days. Its sixth fall meeting is scheduled to go from Friday, November 8 to Sunday, December 1 for 16 racing dates. This entry was posted in The Biz and tagged california racing, david jerkens, del mar ship and win, del mar thoroughbred club, Horse Racing, ship and win program, thoroughbred racing, tom robbins by Del Mar Thoroughbred Club. Bookmark the permalink.